You might be wondering why there is any reason to switch from plastic bottled water to a reusable Akasha bottle. As part of out '6 Things' blog we've come up with 6 reasons why you should consider making the switch to a reusable water bottle. Globally we consume over a million plastic bottles per minute! Our annual consumption of plastic bottles is set to top half a TRILLION by 2021. 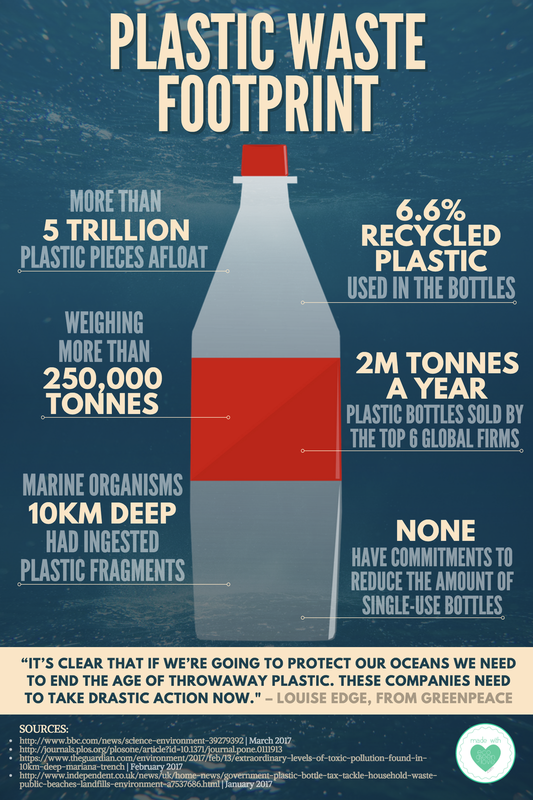 Plastic is not biodegradable, meaning your bottle can hang around for a hundreds of years after you throw it away. This means that Trillions of plastic bottles will be polluting our oceans in only a few years time. Even with recycling efforts, 6 out of 7 plastic bottles consumed are “downcycled”—sent somewhere out of sight and out of mind where, for the next millennia, toxins from degrading plastic containers leach into local watersheds and soil. Big drinks companies are afraid of using 100% recycled plastic because the colour would not be completely clear. Approximately 25% of bottled water is sourced from the tap. Some companies do filter or radiate the tap water with ultraviolet light before selling it to you at several thousand times the cost of municipal tap water. (Examples include Aquafina, Dasani, and many other brands.) Tap water is subject to far more regulations and safety inspections than bottled water. Plastic bottles contain other chemicals that can seep out if bottles are exposed to heat or sit around for a long time. Some of these chemicals are possible endocrine disruptors. To learn more read our 'BPA, Should you be worried' article. Having an Akasha bottle allows you the freedom to decide what goes in your drink. By choosing a durable, reusable water bottle you can make a conscious commitment to helping the environment whilst improving your own health. There are even more practical benefits of owning a reusable bottle including; saving money, keep drinks hot or cold and leak proof designs. The ocean produces 70% of the oxygen we breathe. It is paramount that we maintain the health of our planet, plastic is not something we can tuck away out of sight and out of mind. Plastic can take thousands of years to degrade, our only option is to cut down on our own plastic waste. By making these small changes together we can all save our ocean and create a sustainable future. 🔥 12 HOURS HOT - Need a hot coffee for your commute to work? We've got you covered. Vacuum insulation technology keeps drinks HOT! ❄️ 24 HOURS COLD - Thanks to our Double Walled Vacuum Seal, your drink will stay ice cold regardless of outside temperature. Perfect for long gym workouts or summer road trips. 🔐 NO LEAKS GUARANTEED - Have you ever had a plastic bottle leak water in your bag? This is usually because of the poorly designed, cheap lids. Our specially designed lid means the bottles forms a snug, tight fit every time it is closed, meaning no leaks! Ever! 💪🏼 STRONG AND DURABLE - We've designed our bottle so it will last a lifetime and withstand daily use thanks to a high quality manufacturing process. ✨ EASY GRIP - One of the biggest problems with plastic bottles is how they begin to sweat in warm weather. Thanks to its double wall our bottle will never form condensation, making the bottle easy to open and close in any condition and minimising leakage. 💚 OUR MOVEMENT - We want to inspire our community to take a more sustainable approach to their daily life! Choosing a reusable bottle is the easiest and most effective way to begin! Get to know: @Hetface, Showing us all that Vegan life is easy and delicious!